Before yarns, fibers and colors became her profession, Felicia studied pharmaceutical science. “You had to have very good grades to get in, and I worked really hard to achieve that”, she said. “But on the very first day in the very first lecture, I already had a feeling that it was not for me. I just felt that I did not fit in” she said. But Felicia did not want to disappoint her parents, so she pulled through and finished her degree after five years. 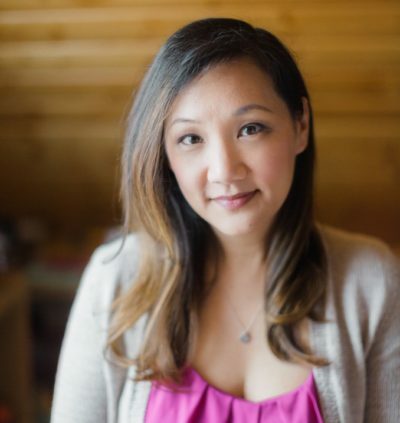 During that time, her creativity found other ways to bloom: She joined a competitive ballroom dancing community and was soon making her own ball gowns and costumes, “in very bright colors as to capture the judges’ attention”, she said. She soon adopted the university Dance Club’s website, took a couple of classes in graphic design, and when she finished university, she had a number of design clients. Knitting and crafting have always been part of her life: “I started to knit in grade 5 or 6 and became obsessed with it. I knit my first sweater in grade 7 but then switched to sewing because it was faster”, Felicia said. “After university I picked up knitting again, playing with yarn and colors, and began to blog about it in 2004”, she said. She named her blog “SweetGeorgia”: “Georgia” from the Strait of Georgia (the water surrounding Vancouver Island), and “Sweet” because she had actually planned to write about something else: “I had thought that I might one day open a bakery and wanted to name it SweetGeorgia, so that’s what I named the blog. But then the blog ended up being all posts about my knitting projects and so I dropped the baking and kept the name.” Lucky for us knitters! 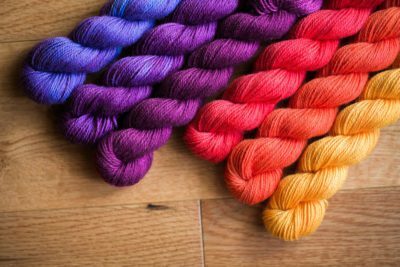 Felicia started hand dyeing yarns for a a simple reason: “I saw all these beautiful yarns in yarn stores and I just could not afford them” she recalled. 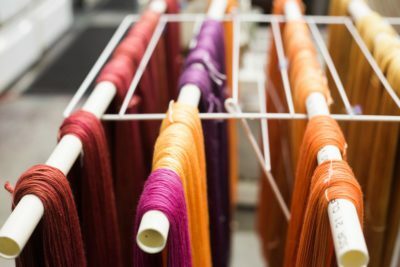 And when she started spinning and only white fiber was available, she took the plunge and started dyeing fiber as well. 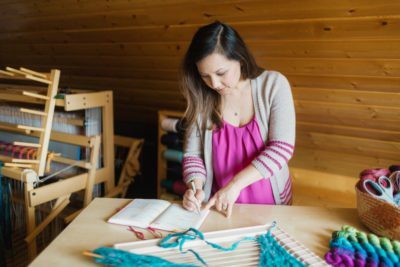 That was back in 2005, and she soon had too much yarn to ever knit up herself, so she started putting it up on Etsy and built her own online shop. 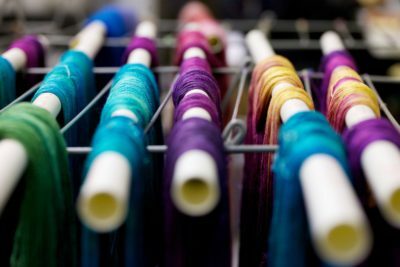 Her yarns were an instant success, she even had a couple of wholesale accounts, but it soon became too much: “I was working 7 days a week, I still had graphic design work to do, and I was doing everything myself from the dyeing to the labeling to taking everything to the post office every day. I was completely burnt out”, Felicia said. So she decided to take a break from everything, to clear her head and re-evaluate. She made a plan and re-started her dyeing operation, this time with a pre-set color palette. She hired help and did not take on wholesale accounts right away, so everything would grow and bloom at a more gentle pace. Today Felicia still loves to develop new colorways, but she also spends a lot of time with her two kids. 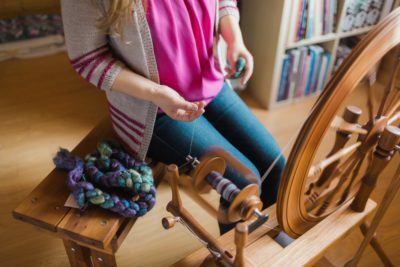 Friday afternoons are reserved for big crafting projects like spinning or weaving, and you can watch her doing that on her weekly vlog (youtube-link). But what about knitting? “I knit a lot, every night when I am with my husband”, Felicia said. This year alone, she has finished five sweaters, a couple of them with stranded yokes. 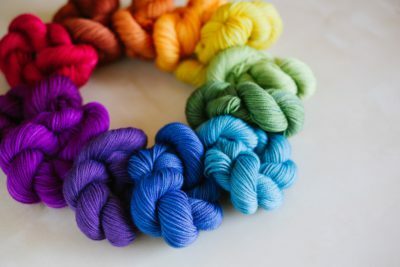 “My favorite yarn for a sweater is a DK weight blend of silk and mohair. It has a beautiful shine but knits up quickly”, she said. Lovely, shiny yarn bases are SweetGeorgia’s signature, and we picked one of those to be a yarn for Strickmich! Club 2019. 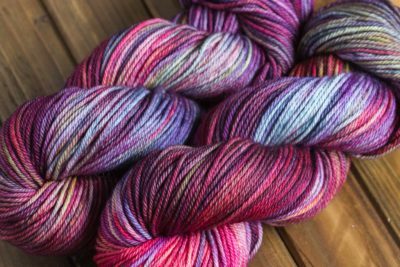 We are happy and excited that Felicia has agreed to dye a new exclusive colorway for Strickmich! Club – and I can’t wait to get my hands on it and start knitting!